A deanship in higher education is an exciting but complex job combining technical administration and academic leadership. On one hand, the dean is an institutional leader, standing up for the faculty, staff and students. On the other, the dean is a middle manager, managing personnel, curriculum and budgets and trying to live up to the expectations of the governing board, president and provost. But what is it really like to be a dean? In "How to Be a Dean," George Justice illuminates both of these leadership roles, which interact and even conflict with each other while deans do their best to help faculty members and students. Providing tested advice, Justice takes readers from the job search through the daily work of the dean and, ultimately, to the larger questions of leadership, excellence and integrity the role provokes. He also explores the roles of "different" deanships in the broader context of academic leadership. 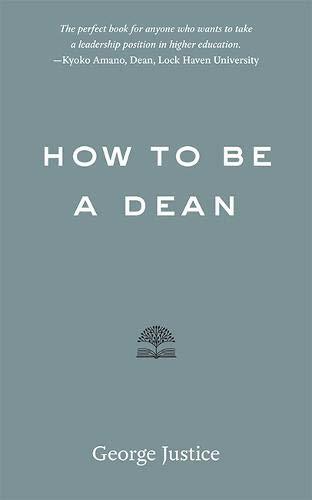 Based on the author's experience as a dean at two large research universities, "How to Be a Dean" is clear, engaging and opinionated. Current deans will use this book to reflect on the work they do in productive ways. Faculty members considering administrative work will find in this book some idea about the day-to-day work required of their institutional leaders. And finally, readers who are simply curious about what deans do will find pointed analysis about what works and what doesn't. George Justice is professor of English in literature at ASU. He has served as dean of the humanities at Arizona State University and dean of the graduate school at the University of Missouri. "The perfect book for new deans, as well as for anyone who aspires to be a dean, wants to take a leadership position in higher education, or has college leadership potential." "If you're a dean and you want a friend, get a dog. But if you're thinking of becoming a dean or want to know what deaning might involve, George Justice's report from the field offers a place to start: a clear-eyed, experienced view of a little-understood, and increasingly complex, part of American higher ed."